Are you looking for a great way to honor those special Job’s Daughter People in you life? 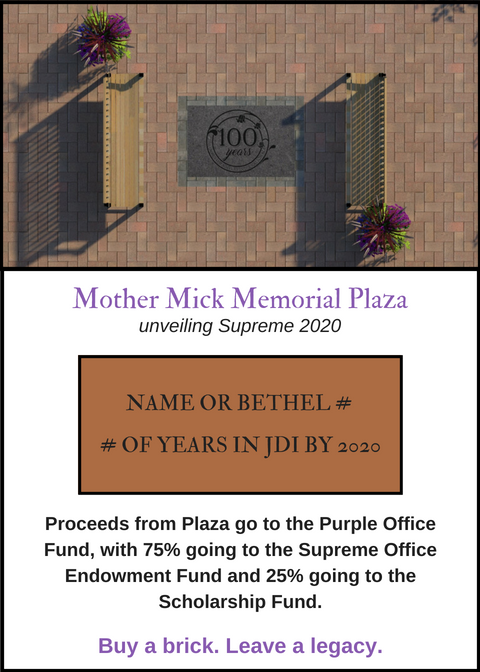 Buy a brick in their honor in the International Walkway at the Supreme Headquarters. For an order form, click here. Support your organization by joining others in becoming a JDI Legacy Maker. Donate at any level and receive our tangible thanks by means of a tac designed exclusively by Doc Morgan Inc. For more information and an order form, click here. Are you looking for a great way to commemorate the New Year? You can celebrate with this great Job’s Daughters Afghan. These high quality afghans feature the JD International Logo as well as the 42nd Chapter, 15th Verse of the Book of Job. They are a bargain at only US $52.00 each. They are great as a gift or a gift to yourself. For more information and an order form, click here. International Center. Now we need your help to re-populate the trees in order to bring the grounds back to their former beauty. For more information on how you can help, click here. Doc Morgan Inc. has been the official jeweler of Job’s Daughters International for the past 42 years. On their website, you can find links to purchase Supreme, Grand, and Bethel jewelry, as well as other merchandise. Remember to contact Doc Morgan for your promotional and fundraising items. Click to visit.